Utilizing pure lead calcium grids, Sun Xtender deep cycle battery plates are thicker than the industry standard for longer cycle life, increased reliability and power. The low impedance AGM design allows for excellent charge acceptance and there is no current limit required with controlled voltage charging. 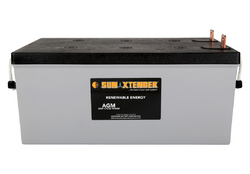 The Sun Xtender battery product line features proprietary PolyGuard™ Microporous Polyethylene Separators, shielding the positive plates against shorting, shock or vibration. No other manufacturers offer this dual layer insulation protection feature. 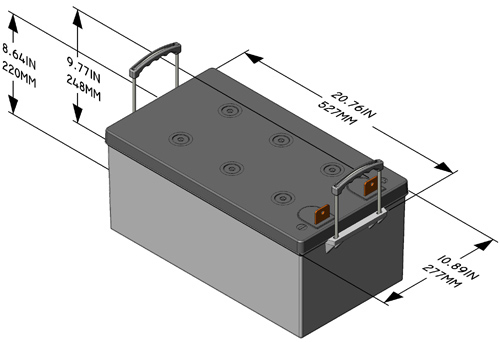 Sun Xtender battery covers and containers are uniquely molded with high impact, reinforced copolymer polypropylene and are designed with thick end walls to prevent bulging. The solid copper L Blade Terminals are corrosion resistant and are supplied with silicon bronze bolts, washers, and nuts. See the Sun Xtender Battery Technical Manual for details on PVX-2580L applications and specifications. This Sun Xtender solar battery document is also available for download and printing. PVX-2580L is used for applications such as Traffic Arrow / Message Boards, Cathodic Protection, Gried Tied & Off Grid Homes, 2-Way Radio Repeaters, SCADA, Navigational Aids, Medical Refrigeration Clinics & Power for Remote Areas / Developing Nations, Microwave Earth / Satellite Stations, Parking Lot Lighting.